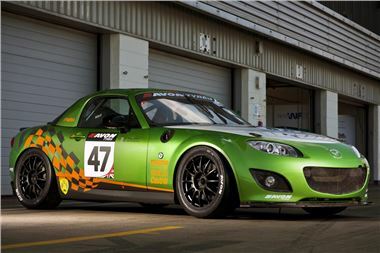 Mazda's iconic roadster, the MX-5, will take on the might of the supercar brands in the British GT Championship in 2012. Following a development year in 2011, which saw the Mazda MX-5 GT run a successful campaign in the Britcar Production GTN Championship, the competitiveness of the car was forcefully demonstrated at the final race of the season at Brands Hatch. The nimble Mazda finished fifth overall, trading places with the more powerful Porsches, Ferraris and Lotus. The 2012 Mazda MX-5 GT4 weighs in at 1,000kg, carrying 150kg of ballast, with a power output of 315bhp from its 2.0-litre engine. The Mazda engine is mated to a paddle shift sequential six-speed Hewland gearbox giving a 0-60mph time of just three seconds with a top speed of 160mph, making this the fastest and most powerful MX-5 in the World. The outstanding handling that has made the MX-5 a favourite amongst drivers looking for an outstanding drive experience has been further developed through the race programme in 2011 with the help of MIRA, the Motor Industry Research Agency. The MX-5 GT4 demonstrates high levels of stability under all loads making the car easy and fun to drive, an important feature for the longer endurance races. Last season the Mazda MX-5 GT demonstrated its strengths in endurance racing, while it is not as powerful as rivals it uses less fuel and is easier on tyres. This translates to less time in the pits and more time on the track which is a winning formula. The British GT Championship is nine rounds over seven weekends. The first race is at Oulton Park in Cheshire on Easter weekend, 7 and 9 April. "We are looking forward to taking on the supercar brands this year and winning," commented Jeremy Thomson, Managing Director for Mazda UK. "Last year was a valuable development year when we established the strengths of the car and then developed the power and handling to best exploit those strengths. We are excited and optimistic about our first year in British GT and fully expect the Mazda MX-5 to upset a few established marques.